This is my 3rd pregnancy and I'm currently 6 months in, so finally feel I can offer some good advice on how to dress your bump without breaking the bank or compromising your style; I know how frustrating it is to go through the different stages (whatever the season) when you're not ready for maternity clothes or can't find something you genuinely like. You're more than likely reluctant to spend money on clothes that you'll only wear for several months when you have baby things to save up for. Whatever your concerns, here's my quick-read, cheat's guide to maternity dressing. 2. Go through your wardrobe and pick out items that can carry you through. You'll be surprised, how many pregnancy-friendly pieces you already have: open blazers for work; loose fitting dresses, jumpers and blouses (great if your bump grows before you're ready to share your exciting news); longer tops and skirts that cope well with the rise in hemline that your growing bump will create; and anything with a bit of lycra. 3. Cheat. I don't know anyone who wasn't frustrated by that in-between stage where lots of your clothes don't fit, but you're not yet ready for maternity clothes. Get past it by popping a vest or sports bra under blouses and button as far as you can, loop a hair tie around button waist trousers and skirts or invest in a trouser extender. 4. Know your style. It doesn't change just because you're pregnant so shop around until you find what you're looking for. The thought of pounding the pavements is unlikely to appeal so search online and for companies that offer free and easy returns, then order in different sizes and try them on in the comfort of your own home. You'll want a selection of clothes that you'll miss when you box them up, not ones you've been uncomfortable in for the best part of a year or that haven't made you feel good about yourself. 5. Consider the seasons. You might be lucky enough for this not to apply but, here in the UK, it's well-worth remembering that you'll transition through seasons and they can be unpredictable. 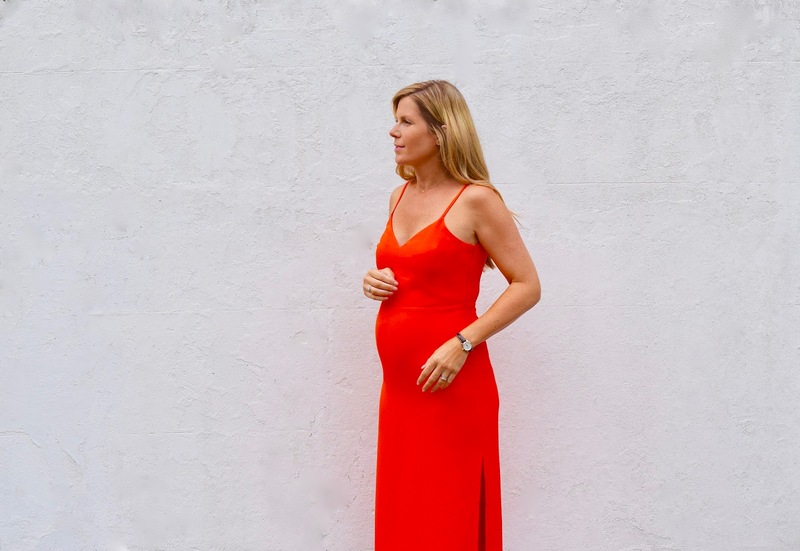 My last two pregnancies were largely winter ones, while this one has seen me sporting a bump in summer, so I added a few summer items to my wardrobe. 6. Smart or casual? First time around, my focus was on looking smart for work, so I built a capsule wardrobe around that and included some items that would work for evenings and weekends (including comfy clothes for lounging at home). I was still on maternity leave when I was pregnant with my second (I know), so it was all about skinny over-the-bump jeans which I'll be popping on again this time around when the weather turns colder. 7. Check your calendar. If you've got weddings, holidays or any event that could through your carefully considered capsule wardrobe into a spin don't wait until the day to work out what you're wearing; plan ahead. We've just got back from our summer holiday and I wanted to feel good by the pool and on the beach so bought a few bikinis that I can wear throughout the summer and after no.3 is born. 8. Swap. So many of us are reluctant to buy maternity clothes as it, somehow, seems extravagant: our bank balance is taking a hit getting ready for the arrival of a newborn so spending money on clothes that we'll only wear for a short time is difficult to stomach. To say my box of maternity clothes has done the rounds is an understatement and you'll, no doubt, have friends and family who can loan you some of theirs. 9. Think about what you'll wear post-birth. Our second baby was breach and nothing was going to turn her, so I had to have a c-section. I knew about it the week before and my bestie gave me some invaluable advice that gave me time to work out which clothes would be the most comfortable; I lived in my over-the-bump maternity leggings, but soon realised my maternity jeans were a no-go as they rubbed on the scar. Several bras and tops that accommodate breastfeeding are probably worthwhile purchases too. 10. Declutter. I emptied my wardrobe of anything that wasn't pregnancy-friendly and it made getting ready so much easier. I honestly don't think you need to spend a small fortune or buy a great deal to see you through your pregnancy(/ies) and, if you stay true to your style and what makes you comfortable, I honestly don't think you'll regret what you've purchased. P.s. I was reluctant to feature any brands in this post as that's not really the aim of this piece, but feel free to pop a message below if you want me to share any. Equally, if you have any advice you're happy to share, please do!